I am grateful that I dream in vivid images. It is difficult to transcribe the most simple images from my mind to paper. Since my dreams are immersive (that is, I feel that I am within a three-dimensional space), I must choose which part of my dream environment to portray. A photographer does the same thing when choosing how to frame an image in the view finder. I was watching a couple of people playing darts. The dart board was transparent as were the darts, which were actually clear plastic pens. I thought I could be very good at the game, as I envisioned throwing the darts straight and true in my dreaming mind’s eye. However, every time I threw a dart, it clattered to the floor. If anyone has any ideas about sketching or painting invisible items, I am very interested in knowing. 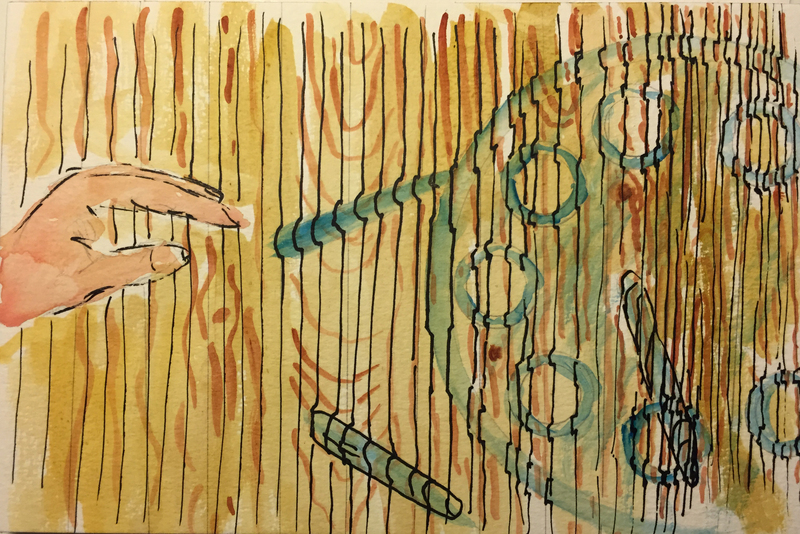 This entry was posted in Personal Stories and tagged abstract expressionism, artistic process, creative process, creativity, dream image, dream imagery, dreamscape, subconscious, visual arts, watercolor. Bookmark the permalink.